The Agouti is a smooth-coated guinea pig that most closely resembles the wild type of guinea pig found in South America. Their coat has a flecked appearance, and each individual hair contains two distinct shades which create a banded effect. The Agouti will also have solid black guard hairs sprinkled through the coat, and if the guinea pig is shown these guard hairs need to be individually plucked out. Their body shape is the same as a Self guinea pig, described as a cobby, brick-shaped body, with strong shoulder, bold eyes and well-placed drooping ears. The commonest colours are golden and silver. They also come in lemon, chocolate, cinnamon and cream. Silver and lemon agoutis have dark eyes, the other colours have ruby eyes. We absolutely love our Agouti’s. We bought them from a pet store where the manager breeds them. They have become very tame since we brought them home at 8 weeks and they are litter/grass trained. (I can’t believe it?!) We noticed their ritual of fussing before toiletting by putting their faces towards their bottoms just before they went. So if we were holding them on our laps at the time or had them out on blankets, we would take them to their cage and wait for them to toilet and then pick them up for cuddles. They are now toilet trained and my daughter takes them to bed with her while she falls asleep and they wait to use their cage. Brilliant children’s pets if you have gentle children. Absolutely amazing!!! 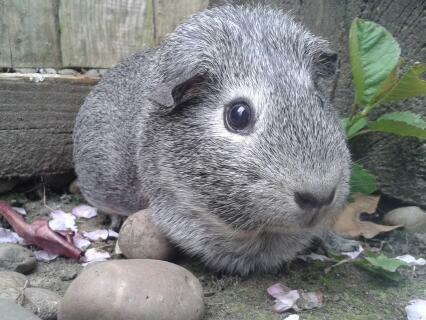 I had guinea pigs as a child, never had an agouti, but must say they are so friendly and amazing to have as pets. A lot more trainable than the guinea pigs I had. Their coats are just beautiful and their personalities match. They call out to us when we are in the kitchen or arriving home after a while of being out. They love their cage and enjoy being in their outdoor cage on the grass too. They are very neat little lawn mowers and love their oaten and Timothy hay. 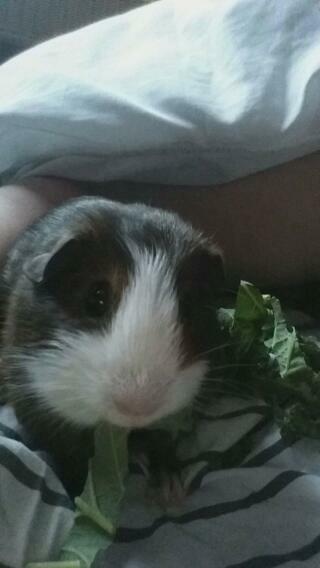 Favourite veg are carrots, capsicum, lettuce, cucumber and parsley. They love apple cores :) The main thing to watch out for are warm temperatures in Summer. Australian temperatures are very hot for little piggies. 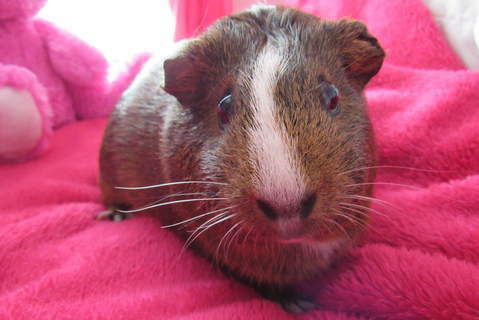 My agouti guinea pig is brownish gold with ears up and it weighs 1.1 kg. 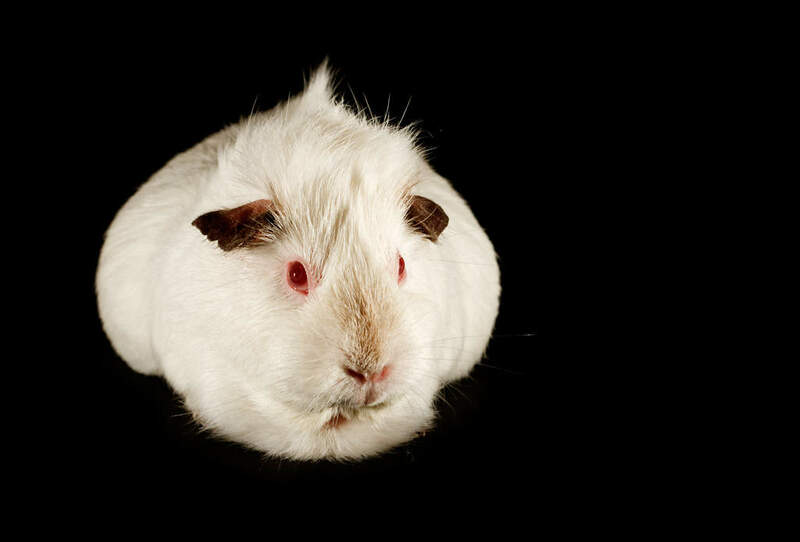 I have been breeding and keeping guinea pigs for nearly twenty years, I think they make fantastic pets with amazing personalities! 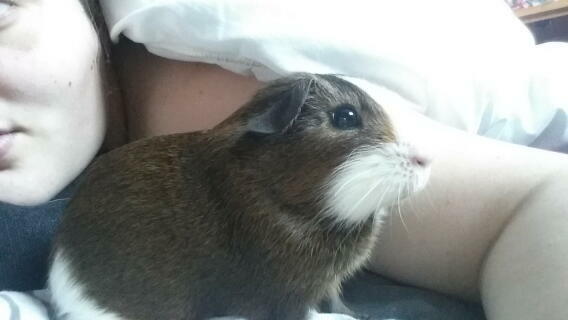 This was before I had my first golden agouti boar Hector, and from this day I became adicted! Hector was robust, full of character and soft as soap. He lead me to branch out into perfecting a line of golden agoutis and a line of silver agoutis. 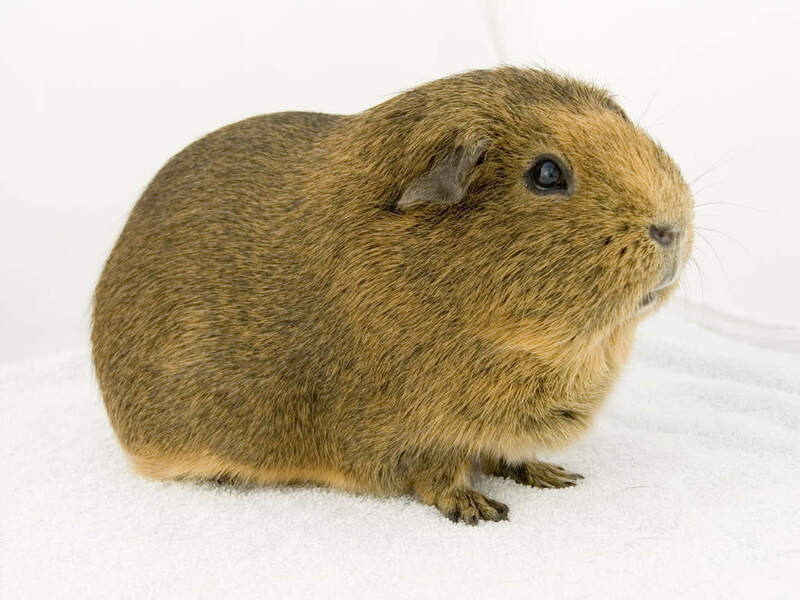 I would recommend agouti cavies to anyone, they are nice big guinea pigs which I find gives children that little bit extra to hold onto. They are robust, strong and have lovely thick shiny coats. This colour is the closest to wild guinea pigs colouring, and they are full of vigure and solid structured. On the opposite side of the coin they are easy to tame and love attention and cuddles, I can't walk past mine without a chorus of squeeks for cabbage and attention. I have found mine have had long lives pushing seven and eight in some cases, and are very hardy to the elements. They make wonderful mothers, very caring and attentive. They simply are the best guinea pigs! Just a slight correction to the general information - Agoutis are indeed recognised in 6 colours, three are black based (have a black band of colour closest to the skin which is also black) and these are silver, golden and lemon, the chocolate based are cinnamon (choc/silver) chocolate (choc/golden) and cream (choc/lemon) with the most commonly seen and shown being currently silvers and lemons - the other four colours are very few in numbers and are usually in the hands of experienced breeders. ALL AGOUTIS HAVE DARK EYES. If you have a ticked cavy that has pink/ruby eyes then these are known as Argentes. 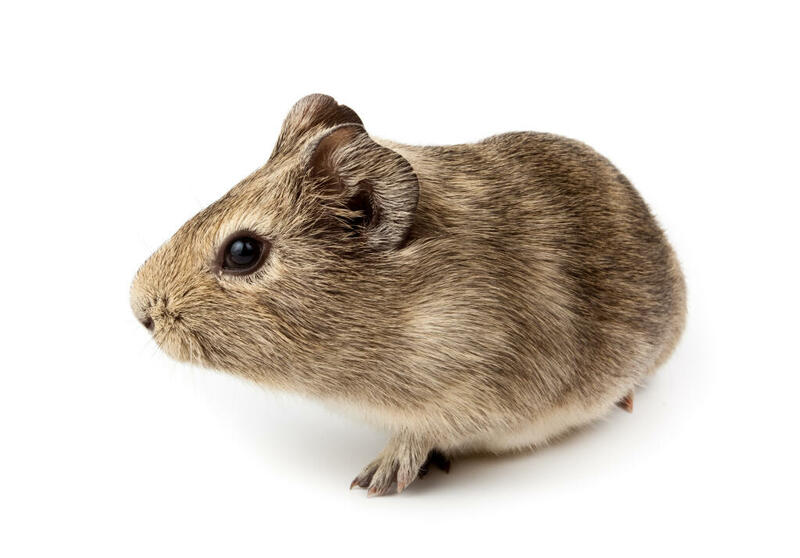 more information about agoutis can be gained from the National Agouti Cavy Club. 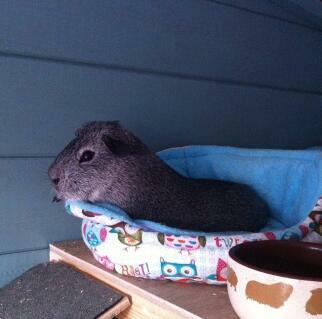 I have agoutis in silver, cinnamon and cream, they are generally big pigs, very laid back, friendly and robust. The boars are capable of good size and their laid back nature makes them excellent candidates for family pets, the sows are great mothers and both generally live to good ages if properly cared for.